So now that it’s officially the month of love and Valentine’s Day is on the way, I thought I’d shares a great recipe for if you’re thinking about a romantic meal for two. There’s no food more romantic than chocolate, and truffles are so delicate and perfect that they make the best Valentine’s dessert. I got really into chocolate truffles after I spent a week in Stokholm last year. Most of the restaurants that we went to had truffles on the menu and I always loved how they served one small chocolate truffle that was so rich and decadent that it was all you needed. Because truffles are often quite expensive the perception is usually that they are very difficult to make and will require lots of ingredients, which couldn’t be further from the truth. 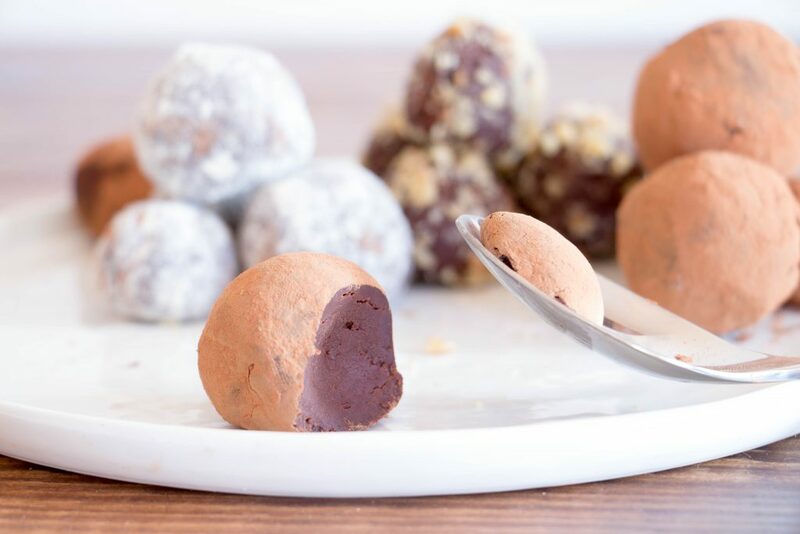 The truffles themselves are made from only cream and chocolate and they can be covered with whatever you like – I chose to use a mixture of cocoa powder, crushed walnuts and coconut flour. Start off by cutting up the chocolate into very small pieces (this is so it will melt easily later) and place in a glass bowl. Place a small saucepan on a medium heat and pour in the cream. Bring the cream to the boil, then pour around half of it over the chocolate and leave for around 15 seconds. This is so the chocolate warms up slowly. Then pour the rest of the cream into the bowl and leave for around 2 minutes. At this point all of the chocolate should be pretty much melted. so whisk it together with the cream until you have a smooth and shiny looking ganache. Place the bowl of ganache into the fridge for around 2-3 hours, giving the ganache time to cool and stiffen. Remove the bowl from the fridge. At this point you're going to make the truffle balls. Ideally you'll use a melon baller here, however it can also easily be done with a teaspoon. Scoop out a small ball of ganache and, on a cold surface, quickly roll into a ball. I like to run my hands under cold water before doing this, sot that the chocolate doesn't warm up too much. 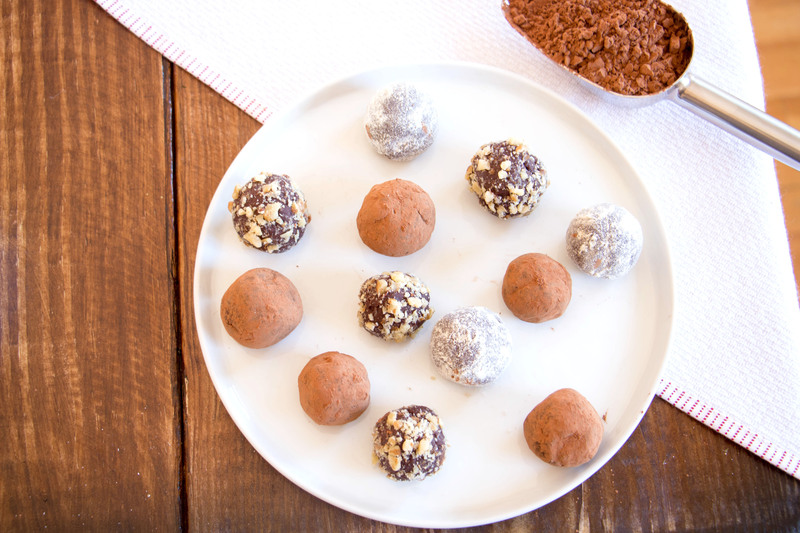 Place each of the truffles onto a baking tray covered with parchment paper. 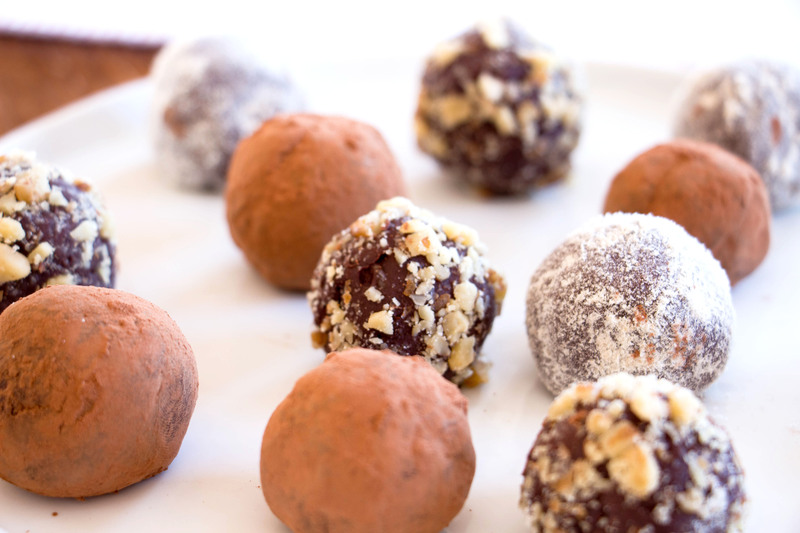 Place the truffle balls back into the fridge overnight (or for at least 4 hours). When you remove the truffles from the fridge they are ready to be coated in whatever you have chosen. If you have a couple of misshapen truffle balls, give the, another light roll before coating them. Once the truffle balls have been coated, place back into the fridge until you are ready to serve them!